I thought it would be nice to share how I work with you guys. 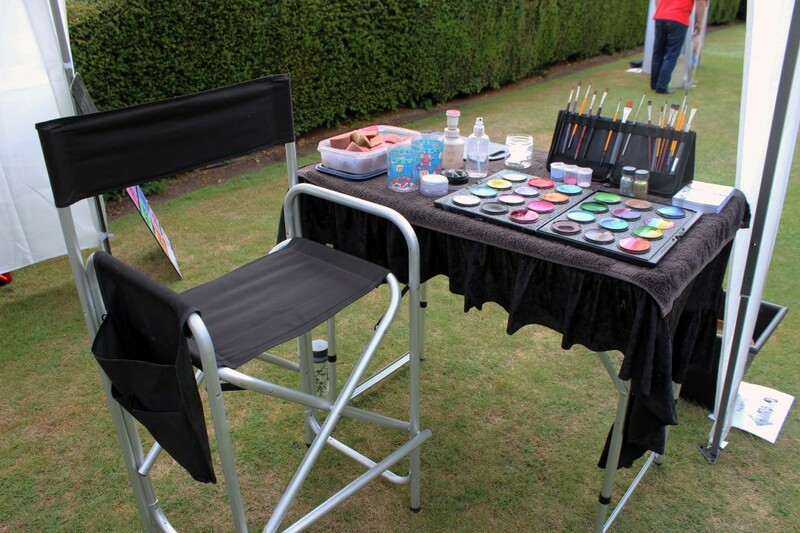 I love to see how other artists set up their equipment for events, mainly because I’m a nosy parker but also because it gives me ideas for things that I could add to my kit. I have been using my current set-up for just over a year now. It took me a long time to get everything perfect and exactly how I wanted but I am very happy with the systems that I have. The directors chair and the table came as part of a set and are both made of aluminium so are incredibly light-weight. They also came with a large bag which makes transporting and storing them very easy. The table has 4 different height adjustments which is fantastic as I am able to use both the tall directors chair or, if my back is a bit achy, I can use two smaller fold-away chairs and not have to reach up high to get to my paints. I purchased mine on Ebay for around £70 but unfortunately they are no-longer listed from the seller. 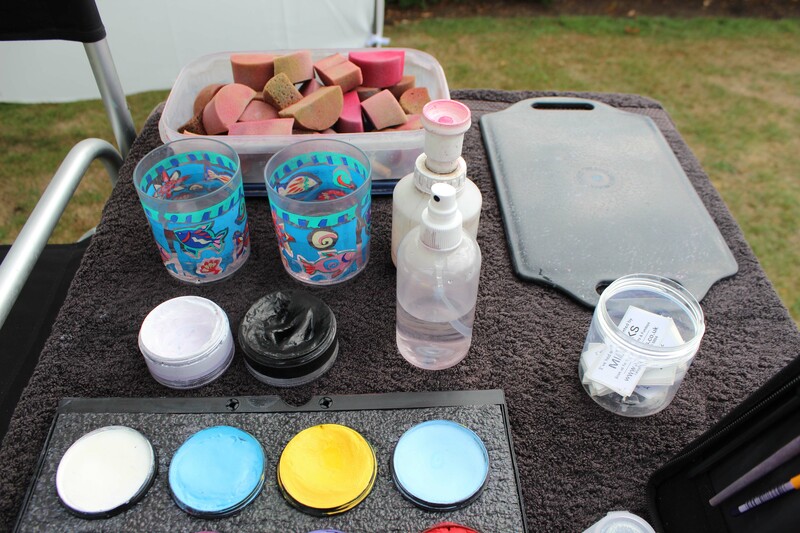 You may be surprised to learn that I only ever take a pallet of 24 colours with me to my events and even then there are some colours that haven’t been touched for months. I know that most painters like to collect as many colours as they can and the thought of leaving some of them at home is just too much to handle, but for me, too much choice is confusing. I keep all of my cakes together (excluding my black & white) in these wonderful Mehron pallets with the foam inserts. They are easy to clean, they look professional, they prevent my paints from wriggling around my table and at the end of a busy day I can just close the case and not have to match up 24 lids to 24 pots! I also have a fairly small collection of brushes, and again, I tend to stick with 4-5 of my favourites and ignore the rest. To keep them tidy I like to use a fold away brush easel. I will be posting a separate article about the brands of paints and brushes that I use very soon so stay tuned for that. At the top of my table I keep a box of clean sponges. I like to keep the lid of the box tucked underneath so that I can access it quickly should the wind start to pick up. It’s never fun to chase your sponges round and round a muddy field. I have two water cups, one for washing brushes that have been used for white paint and one for all of the other colours. I also have my spritzer bottle and just behind that I have a dish dispenser. Now I have been painting for a long time, but in my 17 years I have never come across another artist who carries a dish dispenser in their kit and for the life of me I cannot work out why. THEY ARE AMAZING! Basically you fill the bottom section with water, screw on the top and when you press down on the pump the little cup fills up. It’s perfect for dampening your sponges without having to dip them in your cup. They are available here –http://www.facepainting.uk.com/containers.html. I keep a small pot of stickers to give out to the children. They have been printed with our company details so parents can contact us if they’d like to book us for their own events, and finally I have my mirror. I lay it faced down on my table so that the sun or any overhead lights don’t reflect into peoples eyes. This is fantastic! It’s great that you can share your set up and designs with us! I had never heard of the dish dispenser but I will be taking a look at the site. I’m always interested in what brushes other painters use as I think it’s a good start for someone starting out and don’t know what brand, even though its personal choice and some work for others better! Thank you for sharing and I’m looking forward to reading more! Ashlea, I love your setup. Clean, simple, organized. I have a bunch of little Arty cakes and then the round cakes too and it always looks untidy. I like the brush holder, but do you put the dirty brushes back up with the clean? Love your new blog and am a big fan and subscriber of all of your videos, old and new channels. DO you actually carry your kits in two separate kits, but then combine them, or will both fit, and the lid close securely! I am one of the guilty parties that likes to have a lot of brushes and lot of colors and tip jar and bobby pins in my “kit”. That does require a little more table room. I have been working to streamline my colors, but I do love the tags! I have been meaning to buy an insert that will hold 4 of the two colors and some of the 4-5 color combos. THanks for sharing your set up! Yes I have two of the 12 hole Mehron pallets but I take out one of the inserts and put it in the lid of the other one. It won’t close with two inserts so I have to swap it back at the end but it’s not too much bother. 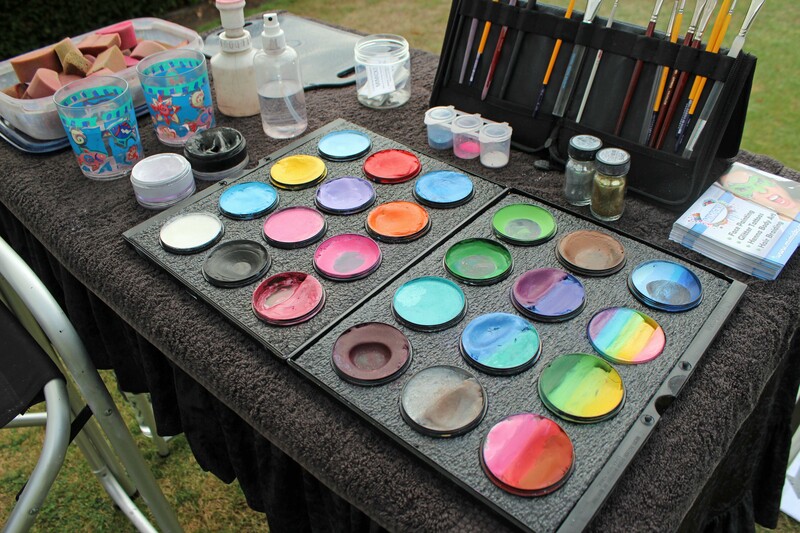 I would like to take this opportunity to let you know I really love your face painting skills. Your linework is really awesome. I started to follow your tutorials on youtube a long time ago. Your designs looks so beautiful and easy to do (but when you try it, its a lot harder than you think; I’m just an amateur). But I love them! I also hope that you can find the time to visit The Netherlands to give a workshop. I would really like to learn ‘a couple of tricks’ from you IRL. Thanks for all the things you want to share with us! Hi Tricia, yes once I have used a brush I put it back in the holder with the rest, then I clean them all together after the event. I haven’t really tried the Arty Cakes but I think I’m going to have a go soon, the designs they produce are fantastic! Question, what do you do with the really really dirty water? I always find it hard to dispose of it. I keep a separate container where I just collect it through the booking but it looks weird. Even when clients say it’s okay to dump it on the grass it doesn’t feel right for me. What can you advice me for that? Btw love your artwork! You’re so amazing!! Hello, thanks so much for your lovely comments. I am loving your set up. I wish I was so compact but I do get in a panic if I get an off menu request that I cant embellish on if I don’t have a specific colour. I am addicted to diamond FX paint and so cant help having a bunch of mini split cakes for fun….laughably though, I never use them much…..everyone tends to want the same face! My new years resolution is to be more streamlined in my approach and reduce my kit bag to the essentials for my most popular work!